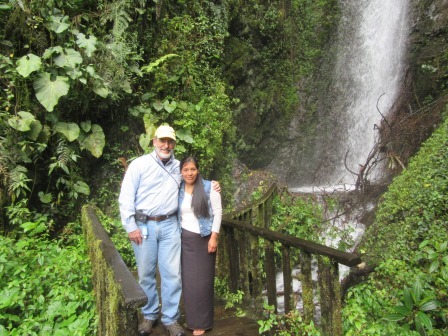 Our Agua Team has arrived in Ecuador for site investigations and followup visits. 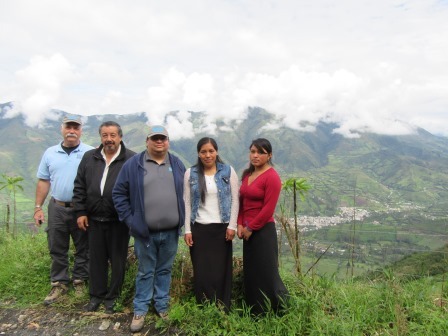 Agua Viva now has five full installations in Ecuador and we have made many friends! What a joy to bring pure clean drinking water to these beautiful people and their communities. Our first folllowup trip was to Jipongato which is located high in the Cloud Forests. We stopped along the way to enjoy the mountaneous beauty and to take our first team photo. When we arrived at the site, we were so pleased to find the water system (installed in 2014, fully operative and clean as a whistle. 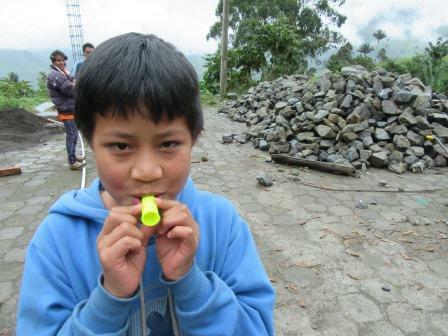 Speaking of whistles, Dale Bain had the great idea of passing out whistles to the children. Wow, was that ever fun. Back on track we soon met up with Moises who hosted us 2-1/2 years ago during the installation. He is the chief operator. The community is now building a new much larger church and Luiz is the new Pastor of the church. It is great to see them growing and so happy. We had a great time. We presented several gifts to Moises and Luiz, and in return, they took us to the most beautiful place in Ecuador: Los Cascades (waterfalls) high up in the Cloud Forest. It was an 800 meter climb. Elena Fernandez joined us on the trip up the mountain.